Tigress from Bandhavgarh National Park. 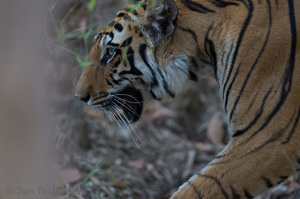 Our days are to an end and we are leaving for Kanha tomorrow on our "scouting" tour. Lots of wildlife, jungle, heat (40 degrees) and I think we found one of best agents in India for wildlife tours. (Image is not cropped).